As indicated in the title of the memoir ‘the house where I grew up’, Ellen writes with the aim of describing her family home and family dynamics. Ellen’s family home is undoubtedly the most interesting aspect of her memoir. Ellen had a complex relationship with housing as she recalls the memory of living in and out of seven homes throughout her life. Ellen’s birth home was in Hounslow, part of the London borough. This is where Ellen and her family spent most of World War II. In Ellen’s early life, her first memory of home was that, her family ‘seemed to live in other people’s houses’. (pg. 1). Living in other people’s houses was known as furnished rooms, where families would co-habit with other families and rent rooms. The next house Ellen remembers brings the memory of her sister being born but the baby died soon after. ‘In of those houses I can remember a sister being born, but the baby died soon afterward’. (pg. 1). Anna Davin pointed that working- class families often experienced the death of a brother or sister in infancy due to poor living standards and medical reasons (Davin, 1996; pg. 16). Better living standards and appropriate housing ultimately provided families a better chance of survival in post war Britain. Ellen mentions ‘another house’ (pg. 1) that her family lived in in Hounslow. What is notable is that Ellen does not complain about having to move houses repeatedly. Davin argues that ‘variations in family income or household composition’ (Davin, 1996; pg. 34) were reasons for families having to move. Ellen’s family relied on her father for financial income to provide better housing. Ellen creates the sense that her family appreciated her father’s hard work and therefore understood the complicated housing situation. Ellen’s family moved to ‘a better place’ (pg.1). This ‘better place’ was a rented house in Southend on Sea, Essex. This rented house became Ellen’s much loved and long lasting family home. 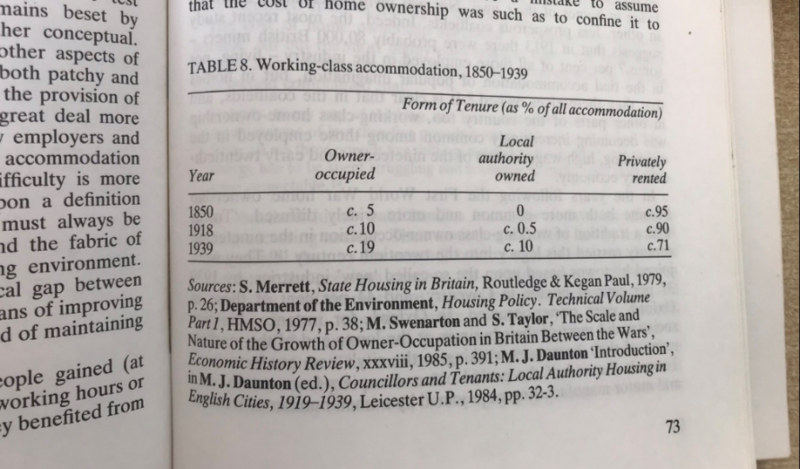 Benson states how the cost of renting in Britain declined considerably between 1850 and 1939 (Benson, 1989; pg. 18). Perhaps this decrease in price explains how the family afforded to rent the house. Table showing working-class accommodation 1850-1939. Ellen recalls how thrilled she was to have the home and how certain features of the house were of importance to her. She writes ‘It had a gas stove, gas lighting, and one cold water tap’. (pg. 1). We take these kinds of amenities for granted today in the 21st century but running cold water was a triumph for Ellen’s family as it was only in 1914 that nearly ‘every house in the country had its own supply of piped water’. (Benson, 1989; pg. 76). The simple features of a water tap, front door and back garden ‘with a real clothes line’ (pg. 1) provided pleasure and comfort for Ellen’s family. Ellen’s family shaped the domestic space to make it unique by adding furniture in ‘from time to time’. (pg. 2). There was now carpet on the stairs, washing on the line and pictures on the wall- Ellen recalls ‘It was not a house anymore it was a home’. (pg. 2). From this, we learn that Ellen considers a home to be a space that a family creates by adding furniture, family possessions, creating a sense of comfort and indeed memories. Ellen recalls the memory of going to Covent Garden market with her father to choose flowers for the front living room. She recalls the room being perfumed with narcissus, daffodils, jonquils and violets. Ellen still remembers the smell of the room when spring occurs and it fills her with ‘nostalgia’. (pg.2). Nostalgia is a key emotion in working- class autobiographies and Ellen’s sweet memory reminds us how important domestic spaces are for the recollection of memories. 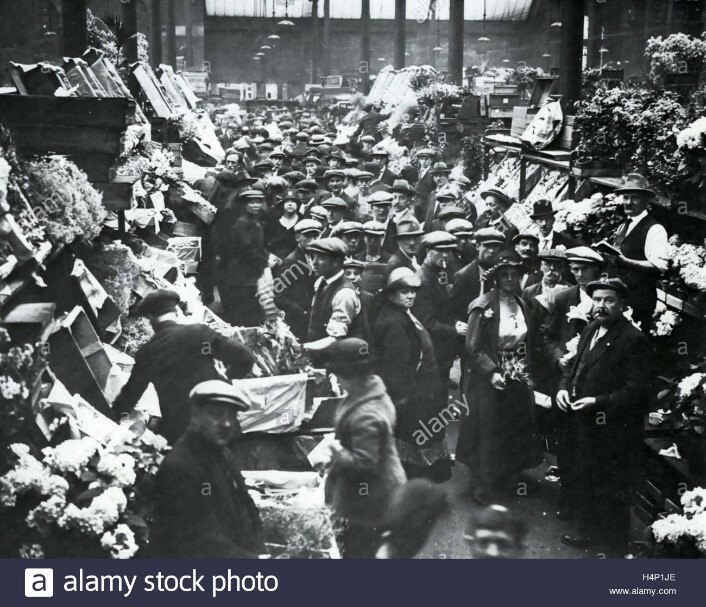 Covent Garden Flower Market, London, 1925. The family home was a terrace house with neighbours at both sides including children of the same age. The streets were ‘lined with trees and no cars in those days’. (pg. 2). The streets provided Ellen and her siblings the chance to indulge in the freedom of play with the neighbourhood children. The house therefore not only provided a home but a space for Ellen and her siblings to play together. The most comforting description of the family home is when Ellen recalls ‘I felt very safe’. (pg. 2). Given the instability of Britain in the 1930s-1950s, it is clear that the family home and domestic surroundings could offer a working-class child comfort and security. Davin, Anna. (1996) Growing up Poor: Home, School and Street in London 1870-1914. Cambridge: Polity Press, London: Rivers Oram Press.